Although still in its earliest stages, artificial intelligence (AI) is radically transforming all aspects of society. With the immanent emergence of Artificial Super Intelligence (ASI) and the illusory temptations of ‘transhumanism’, mankind stands at a crossroads. In Humanity’s Last Stand, Nicanor Perlas makes an urgent plea. It is imperative, he says, that we take immediate steps to ensure that digitized technology is aligned to human values and priorities. Otherwise, ASI will kill the essence of our humanity. Further, if we do not master it now, ASI will transform mankind into its own image. Ultimately, it will destroy the human race. AI experts have not offered a single cogent solution to this existential threat. Rudolf Steiner, however, not only foresaw these developments, but gave clear alternatives. Steiner, the founder of a contemporary, scientific approach to spirituality, provided philosophical, ontological and social innovations to save humanity from the abyss. It is the task of the global anthroposophical movement to pioneer this civilization-saving work: to establish spiritual-scientific ideas in mainstream culture that would allow AI to emerge in a healthier societal context. 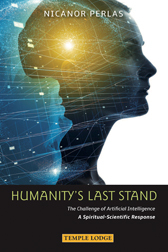 Perlas gives an overview of the phenomenon of AI together with its related transhuman concepts of ‘perfecting humanity’, and outlines the critical internal and external responses required to meet them with consciousness. In particular, he addresses the movement connected to the work of Rudolf Steiner, indicating its all-important tasks: to cooperate with progressive individuals and movements, including scientists and civil society activists; to mobilize its ‘daughter’ movements for action; and, ultimately, to cooperate with the spiritual powers that have guided and served humanity since the dawn of time. This, says the author, is humanity’s last stand, and failure is not an option. NICANOR PERLAS is an adviser, global activist, writer and speaker on artificial intelligence, globalization and spiritualized science. He has advised UN agencies, the Office of the President and Congress as well as cities and towns undertaking large-scale social threefolding projects. He has headed global and national civil society networks that were responsible for stopping 12 nuclear power plants, banning 32 pesticide formulations and bringing about mainstream sustainable development, including organic farming in the Philippines. Perlas is a member of the Senate Task Force on Artificial Intelligence. For the global impact of his work, he has received the Right Livelihood Award (Alternative Nobel Prize), the Outstanding Filipino Award and UNEP’S Global 500 Award. He is the author of Shaping Globalization: Civil Society, Cultural Power, Threefolding.